Find the answers to common questions about online physical education from students and parents below. Find the FAQ for schools and educators by clicking here. If your question isn’t covered, contact us and we’ll be happy to provide you with any information you need. We’re here for you. Q: What is cFitness Academy? A: Carone Learning’s cFitness Academy is an accredited, supplemental, online school. We offer and provide credit for online health, PE, elective and career courses, but do not offer a diploma option. Credit on an official cFitness Academy transcript can be transferred back to a student’s diploma-granting school. Q: Is Carone Learning an accredited organization? A: YES! Carone Learning and cFitness Academy are accredited through AdvancED. You can view our International Registry of Accrediation here. Q: What if my school uses a different accrediting organization, can they still accept credit? A: There are several regional school accrediting organizations in the U.S. based on geographical location. Schools accredited under any one of these accredited organizations are generally known to accept credit from schools that are under other accredited organizations on this list. Q: How can students receive credit for Carone Learning courses? A: As an accredited school, Carone Learning’s cFitness Academy can provide credit as well as send an official transcript to a student’s diploma-granting school. Although credit is generally accepted from one accredited organization to another, we recommend that students consult with their school counselors. The attached getting credit letter can be provided to a school. Note that at the end of each course, students will receive an electronic completion certificate. An official transcript can be ordered for an additional $25 fee. Q: How much credit is each course worth? A: Each course is one semester credit or 0.5 credits in most states (5 units in CA). Q: My counselor is asking if the courses meet state standards. A: Yes! Although the names may be different than course names for each state, Carone Learning courses meet national academic and professional standards, as well as academic learning standards for most states. Q: What courses are available for each grade level? A: Go here to learn more about our health, PE, elective and career course options. Q: What is the cost for a course? A: The cost varies depending on the type of course. You can find a chart with a breakdown of course types and cost here. Q: Are courses synchronous or asynchronous? A: All courses are designed to be asynchronous, meaning there is no required live class time. Students can work on courses anytime, anywhere. Q: Is there a teacher with the course? A: Although students can work through each online course on their own, they also have access to a dedicated teacher. Our instructors maintain regular communication with the student and parent, monitor tasks, grade assignments, and provide timely and personalized feedback to students. Students can contact teachers via email or phone, as well as reach them during a specified office hour each week. Any questions will generally be responded to within 24 hours (M-F) and assignments graded within 3 days (M-F). Q: Is there a set schedule students have to follow? A: No. Although students are encouraged to work in the course on a regular basis, there is no set schedule and students can work at their own pace. Students taking a PE course should note that there is a minimum requirement of fitness logs that must be submitted weekly. Q: Is there a set time frame students have to complete a course? Q: Can students get an extension if they need more time to complete the course? A: Yes. cFitness Academy provides a free two-week extension option (two weeks beyond original end date). Additional extensions can be purchased on a weekly basis for an additional fee of $15 per week. Q: Is there a drop period? A: Yes. Students can drop a course within 7 days to receive a full refund (minus a $25 processing fee). Please note that equipment orders are non-refundable. A: Full courses (with full teacher support) cost $279. An independent study course costs $149. Q: What are the technical requirements? Q: Are the courses iPad, iPhone, tablet, and device accessible? A: Yes. Carone Learning courses are browser and device compatible. We also now offer MP4 versions of our multimedia flash lessons so they can be viewed on Apple devices. Q: Are there any textbooks or other materials required? A: No. Our courses are textbook free! All of the necessary content and information needed to complete a Carone Learning course is included in the course itself. Some optional equipment may be purchased for PE courses, such as resistance equipment or fitness tracking watches. Q: What types of tasks and assignments are required in a Carone Learning course? A: Within a course, students watch relevant content videos, engage in threaded discussion boards, complete meaningful assignments and journal entries, and participate in tailored physical activity (for PE classes). Additionally, students have section quizzes, unit exams, and comprehensive final exams. Q: What are the student expectations? A: In addition to working on the course on a regular basis, students are expected to abide by cFitness Academy’s code of conduct and academic policies. View additional cFitness Academy policies here. Q: How are the Carone Learning courses appropriate for a variety of learners? A: The Carone Learning courses were designed using sound instructional theory. They are user friendly, easily navigable, and very consistent throughout. In addition, multimedia lessons combine text, pictures, video, and audio to greatly enhance understanding and cater to a variety of learning styles. Students receive help and feedback from a dedicated instructor. Students can review the course information as many times as they need. Printable handouts are also available for students. If a student has an IEP or needs accommodations, please make a note upon registering, as well as contact the instructor once the student is enrolled so we can make the necessary adjustments. Q: What is the difference between the various types of courses offered? Accelerated courses can be taken at a faster pace. This applies mainly to PE courses with varying fitness log requirements for full semester and accelerated courses. Credit recovery courses are designed for students that have previously failed a health or PE course and need to recover credit. They address all the same information, but the workload is reduced as students demonstrate mastery. Independent study courses provide limited teacher support. Here students work through the content on their own and submit a packet of work to be graded at the end of the course. They still have access to an instructor if they have questions, but do not receive the regular communication, grading, and feedback. These courses are only recommended for students that are highly motivated and self-sufficient. See chart below for additional differences. 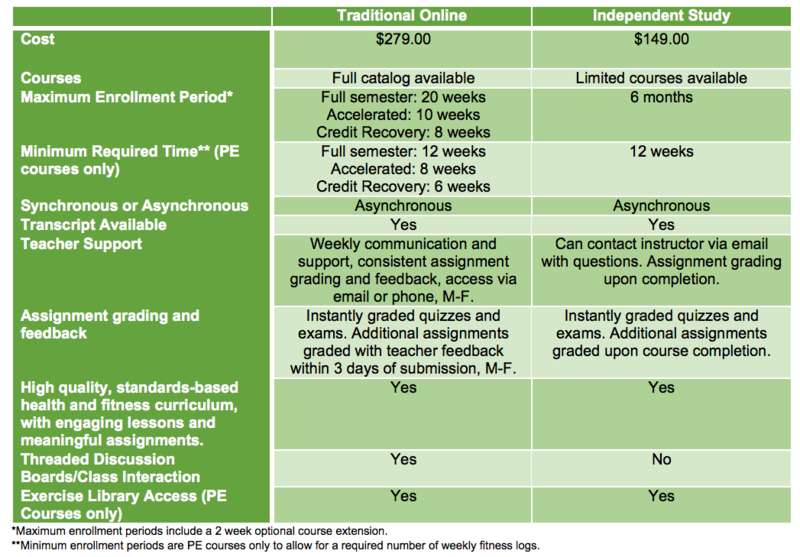 Q: How do I know which health or online physical education course to take? A: For high school, we recommend Fitness Fundamentals 1 or 2, Comprehensive PE, Group Sports, or Individual Sports as these courses most commonly meet state requirements. For middle school, if students only need one or two semesters we recommend Fitness Basics 1 and 2. If students need PE each year in middle school we have three courses (6 semesters) to choose from. Health and personal wellness meets the high school health requirement. Middle school health meets the middle school health requirement. If an additional health course is required in high school or middle school the Life Skills course can be used. Q: Is there a recommended sequencing for the career courses? A: Although physical education courses can be taken in any order, we do have a recommended sequencing available. Q: Are there certificates that students can receive for completing Carone Learning’s career courses? A: Carone Learning provides a certificate of completion for each course, which can be beneficial as students look for related work. However, in some areas it is recommended that students seek certification from the nationally recognized certifying agencies for each area, as noted below. The Personal Training course was designed based on the American Council on Exercise (ACE) recommendations for personal training and can be used as a preparatory course for students to take the ACE certification exam. The Coaching course is based on NASPE’s National Standards for Sport Coaches, although no specific certificate is required in this field. The Sports Officiating course is based on professional best practices. Official certification requirements vary by state. The Nursing courses are preparatory to students entering an additional nursing education program or taking a CNA exam (generally some additional hands-on experience is required). Q: How does online physical education work? A: Go here for more information on the power of online PE. Q: How does the physical activity component work in the PE courses? A: Although our PE courses are delivered online, the physical activity required in these courses is anything but virtual! Fitness levels and activity for courses are measured with various pre- and post-fitness assessments. Students are required to keep a detailed log of their weekly fitness activities and to evaluate their progress through periodic evaluations or “Fitness Checkpoints.” Typically, students must complete at least three hours of physical activity per week, including components of cardio, strength, and flexibility training. (For accelerated courses the exercise requirement is four hours per week). In addition to their weekly self-chosen activities, some of the courses include skills assignments in which students practice specific physical skills, then submit video assignments so that the instructor can provide feedback and evaluate competency. Q: How do you verify that students are actually exercising? A: Several cross-checks are in place to help verify student activity. Students record their physical activity and heart rate on exercise logs. The instructor communicates with the student and supervising adult regularly to monitor progress. Weekly personal progress reflections and fitness assessments are also used to gauge the accuracy of a student’s fitness log. In addition, the courses require at least one form of external verification. This verification may be provided by a parent, guardian, or supervising adult OR, optionally, through online-syncing hardware devices, such as Polar Heart Rate Monitors or MOVband activity monitors. Q: What equipment is required? Do students need to have access to a gym? A: There are no additional textbooks or equipment required for students to complete the Carone Learning courses. We do recommend that students have access to some exercise equipment when taking a PE course, although it is not required. With each PE course students have complimentary access to Carone Learning’s Exercise Library resource. Within the library there are dozens of exercises to choose from that require no equipment. Q: How do students know what exercises to perform in the PE courses? A: Students are required to participate in a variety of exercises, including cardio, strength, and flexibility (at the high school level). However, within those requirements, students can choose their own exercises. Grade 6-12 students looking for further options and instruction can consult the complimentary Carone Learning Exercise Library, which provides instruction, pictures, and video of almost 300 different exercises involving weights, exercise bands, or no equipment whatsoever. Elementary school students and parents receive access to Carone Learning’s Activity Library, which includes pictures, videos, and instructions for age-appropriate skills, activities, and games. In some courses (such as group, individual, and dual sports), students may have opportunities to try a variety of activities as specified in the course and complete a corresponding skills assignment and/or report on their experience. Q: Can the Carone Learning courses accommodate students with physical limitations? A: Because exercise programs can be tailored to meet the needs of each student, the Carone Learning courses are ideal for students of all fitness levels and abilities. Although any of our PE courses can be modified to meet special needs, our Adaptive PE course is designed specifically for students with physical limitations. If there is a physical or academic need we should be aware of, please make a note upon registration. Also contact the teacher after enrollment to discuss accommodations.